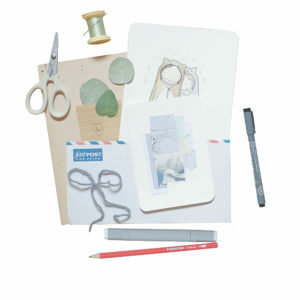 Aimed at promoting small artworks as well as excitement through snailmail. Each one is a pretty mailing filled with one original hand sewn collage and one original watercolour illustration. Each one is unique. The collages and illustrations pictured here are only examples of my work to give you an idea of style – the actual pieces will be different and may come from the archives or made to order. Get ready to be surprised! The works will be small in size – small enough to fit inside a standard envelope. These are originals – not prints! If you would like to send one as a gift, let me know the recipient’s name and a message (optional) and I will include a handwritten note. If you are absolutely set on something specific for the illustration and it is simple enough, I’ll do my best to honour your request! Packaging is thoughtful and lovely. Worldwide shipping is included in the price.